The traveling salesman problem (TSP) asks for the shortest circuit that visits a given collection of cities. For the purposes of this question, the cities will be points in the plane and the distances between them will be the usual Euclidean distances (rounded to the nearest integer). The circuit must be "round-trip", meaning it must return to the starting city. Concorde is available for download as source code or an executable. By default, it uses the built-in linear program (LP) solver QSopt, but it can also use better LP solvers like CPLEX. What is the smallest TSP instance you can generate that takes Concorde more than five minutes to solve? You can write a program to output the instance, or use any other method you would like. The fewer points in the instance the better. Ties will be broken by the file size of the instance (see below). The settings that should be used on NEOS are "Concorde data(xy-list file, L2 norm)", "Algorithm: Concorde(QSopt)", and "Random seed: fixed". The 88 city instance from this family takes Concorde on the NEOS server more than 5 minutes. The 178-city instance from this family takes already more than a day to solve. The following Python 3.x script generates the coordinates of 911 cities. 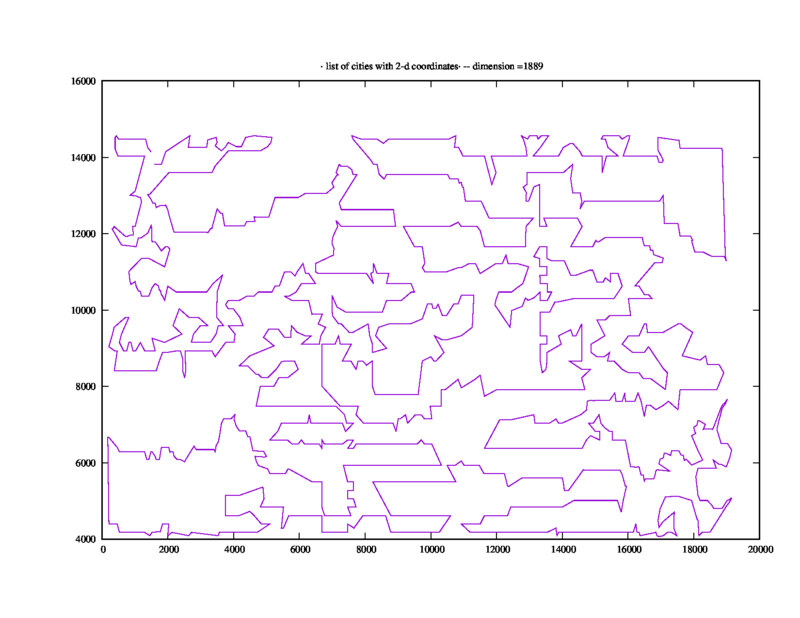 It took NEOS 1418 seconds to calculate the shortest path of 47739. 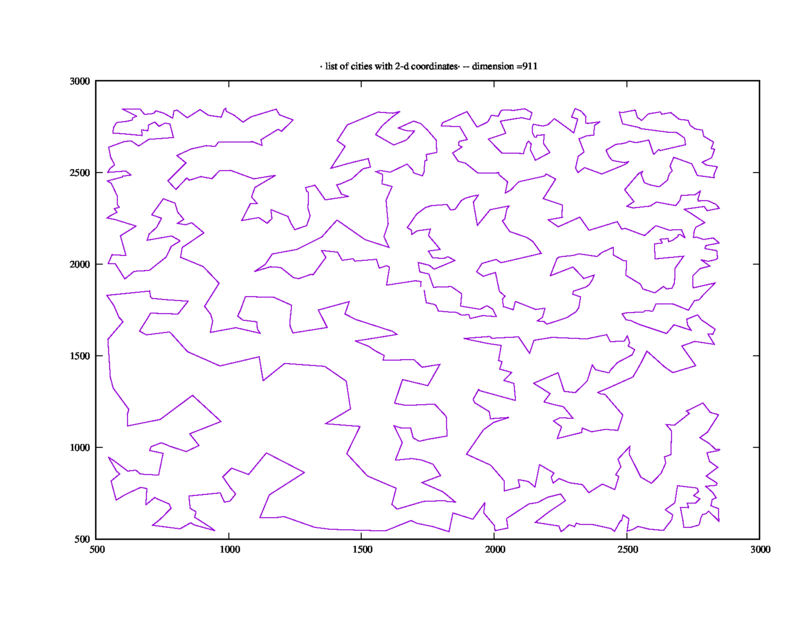 The code/algorithm is based on the Feigenbaum bifurcation, which I used to generate a series of values, which I used as a basis for generating the coordinates of the cities. I experimented with the parameters until I found a number of cities under 1000 that took NEOS a surprising amount of time (well above the required 5 minutes). PS: I have a script running in search for a lower number of cities that also take >5 minutes on NEOS. I'll post them in this answer if I find any. Not the answer you're looking for? Browse other questions tagged code-challenge optimization busy-beaver restricted-time or ask your own question.